Natural gas that can be produced from coal or biomass is known as ’synthetic natural gas’ or ’substitute natural gas’ (SNG). 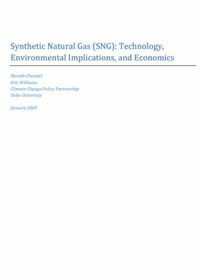 This Duke University paper examines the different technologies for SNG generation, the cost, and the environmental impacts of SNG. The paper identifies the conditions under which SNG production could be economically viable.